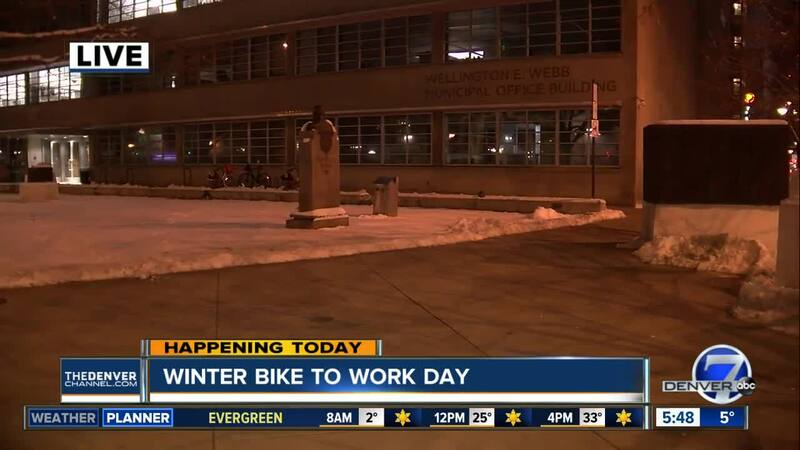 Friday is Winter Bike to Work Day and despite the cold, more than 3,000 people in Colorado have signed up to bike to work. "Last year, the Denver region had the second highest participation in the world," said Douglas Rex, executive director for DRCOG. "This year, we’re going for first place. If you’re used to bike commuting in warmer weather, it takes just a few small adjustments to make winter bike commuting more comfortable." "Layers are really the key," explained Winna MacLaren, the public relations specialist for DRCOG's Way to Go program. MacLaren also recommends gloves to protect your hands from the extra wind chill on your bike and a hat under your helmet. "I love Bike to Work day in the winter, just because you really get the enthusiastic cyclists that come out," MacLaren said. There are several breakfast stations open from 6:30 a.m. 9:30 a.m. There are also some stations open in the afternoon. Address: Cleveland & 15th, Webb Bldg. Details: Logan House Coffee offering 10% off all coffee beverages. Bike Shop Girl Family Cyclery will be on hand for free basic bike adjustments. Cheluna Pit Stop offering drink specials from 4 – 6 p.m. Aurora, Colorado city volunteers will be on hand to celebrate with you. Address: Aurora Metro Center Station @ 14555 E Centrepoint Dr. Details: Warm beverages, breakfast burrito (sponsored by Bicycle Aurora) and a cozy red scarf from DRCOG. Details: Riders who mention Winter Bike to Work Day get 20% off their tabs. They can leave their business cards to win a free happy hour for 10 people. Address: 11801 Community Center Dr. Details: Gather some swag, have some refreshments and warm up a bit. Details: Enjoy a free pint of any RiNo Exclusive beer from 4-6pm. Live Music by Marshy Roots from 6-8pm. You can learn more about how to dress and how to register to help Denver win the top spot this year on WinterToBikeToWorkDay.org .